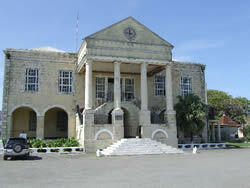 This courthouse was erected in 1815. The building is a Georgian design. These building are usually well proportioned with seemingly vertical and horizontal grads crossing the building. Other unique features of this type of architecture include fanlights, shingled walls and jalousies. The courthouse though razed by fire in 1926 was rebuilt. It numbered among the first official buildings in the town.